(a) Install the transfer assembly to the automatic transaxle assembly with 2 new bolts and the 6 nuts. 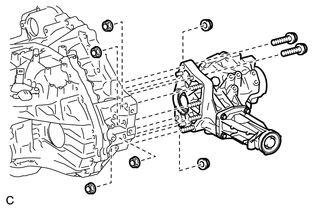 Install the transfer assembly to the automatic transaxle assembly horizontally. Do not touch the transfer assembly oil seals during installation.